It is indeed a moment of pride and euphoria when you decide to transform your business from local to global. But make sure you do not miss out on website localization – one of the most crucial aspects that can guarantee your global success. Many businesses make a common mistake by thinking that, since English is a global language, they can woo their customers with an English only website. However, statistics reveal that in the last decade, the number of English-speaking internet users dwindled from 56 to 27 percent as a result of a significant spurt in the number of non-English-speaking users. These figures should be enough to get you into thinking mode, and this blog will surely help you make an informed decision. With digital marketing overwhelming all other forms of marketing, the relevance of SEO keywords has increased substantially. This has resulted in a fierce competition of keywords in the English language, thereby making it difficult for a small business to stand out in online searches. 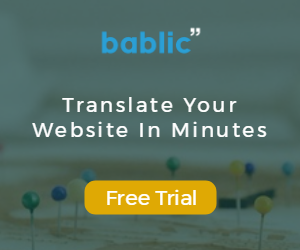 However, if you localize your website, you can have an entirely new pool of words in the each local language, that would give you an edge locally. The new pool of keywords in the local language may be exploited further to increase your domain authority, which will eventually help you to grow your sales. Businesses are all about winning the trust of customers by connecting well with them. However, a good connection can only be ensured by understanding your customers’ apprehensions, appreciating their needs and valuing their concerns. This is precisely what website localization does. Attention to the native language and cultural preferences of a user facilitates trust building. According to a study done by Common Sense Advisory, 54.2% of respondents claimed they purchased a product online only if it was available in their native language, whereas 56.2% said they would prefer receiving information in their own language rather than a lower price. Studies show that 73% of all internet traffic comes from non-English speaking countries. This automatically makes non-English speaking people an excitingly new pool of potential customers. Only website localization can help you tap into this ever-increasing base of customers. With such startling figures, if you still choose to ignore website localization, it may result in missing out on a huge opportunity for your business. Going global does not necessarily mean opening up an office in a foreign location in the first place. Besides, it may prove to be detrimental if the response of customers is not evaluated beforehand. Website localization can turn out to be a savior, through which you may test the waters before taking the plunge. Website localization can help you realize your dream of owning a global business. Investing in it could be the wisest choice you make.